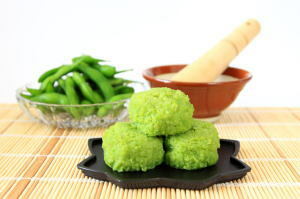 Zunda Mochi ('ずんだ餅', is classified into sweets), is known as Edamame Rice Cake in English, and 毛豆年糕 (Máodòu niángāo) in Chinese. It is the Japanese style sweets. Green Soybean Rice Cake, Jinda Mochi, Nuta Mochi, Bandai Mochi. Glutinous Rice Flour, Edamame, Salt, Sugar.